This document has been proactively released. Two sentences in paragraph 64 would not be appropriate to release and, if requested, would be withheld under the Official Information Act 1982 (the Act). The relevant section of the Act that applies is section 9(2)(f)(iv), maintaining the constitutional conventions for the time being which protect the confidentiality of advice tendered by Ministers of the Crown and officials. No public interest has been identified that would outweigh the reasons for withholding it. 1 This paper seeks policy approvals for the drafting of the Secondary Legislation (Access) Bill. The Bill will amend empowering Acts to specify which instruments made under them are secondary legislation and therefore required to be published in accordance with the Legislation Bill. In particular, I seek Cabinet’s agreement to the plan for the Bill's introduction, the principles being used to identify secondary legislation, when exemptions from publication, presentation and disallowance provisions of the Legislation Bill should apply, and various transitional matters. 2 The Secondary Legislation (Access) Bill (SLAB) is the second of two bills required to implement the Access to Secondary Legislation Project. The first – the Legislation Bill, currently awaiting its second reading – contains reforms to improve access to secondary legislation. It provides that, with limited exceptions, all secondary legislation must be available through the New Zealand Legislation website, presented to the House and subject to disallowance. 3 The SLAB, which is in preparation, will determine which instruments made under Acts of Parliament will be subject to the Legislation Bill's requirements. It will amend each provision on the statute book that empowers the making of instruments with legislative effect to classify those instruments as secondary legislation. It will also apply exceptions, where these are required, to the default requirements of the Legislation Bill. 4.3.2 which secondary legislation should be exempt from disallowance under the Legislation Bill. 4.6.3 consultation with bodies empowered to make secondary legislation on the draft amendments to their empowering legislation. 5 This paper also updates you on the planning for the implementation of the bills. 6.3 providing access to all secondary legislation through the New Zealand Legislation website. 7.3 will be subject to disallowance. 8 The second bill, currently known as the Secondary Legislation (Access) Bill (SLAB), is in preparation and will amend each provision on the statute book that empowers the making of instruments with legislative effect. It will classify those instruments as secondary legislation. The definition of "secondary legislation" in clause 5 of the Legislation Bill effectively states that an instrument made under an Act will be "secondary legislation" if the empowering Act says it is. By applying a consistent test to determine what is secondary legislation, the SLAB will replace the existing complex and uncertain definitions of types of delegated legislation. By specifying their status at the outset in empowering legislation, it will also remove the need to apply those uncertain definitions on an ongoing and case-by-case basis to particular instruments, and the resulting legal uncertainty and scope for disagreement. 10 The SLAB will amend over 600 Acts. While considerable progress has been made in drafting amendments, the work is legally complex and requires the PCO to consult with some 30 agencies that administer the Acts that are being amended. I expect that final drafts of about 2,000 amendments will be ready by the end of June 2019, and all amendments will be ready in the second half of the year. I consider it important to set clear expectations for administering departments about the timeframes for the project, and to make the best use of the time available to progress the Bill through the parliamentary process. 11 Accordingly, I propose to split the SLAB into two tranches. The first tranche, comprising approximately half of the total amendments required in the Bill, would be ready for introduction by the end of June 2019. The second tranche would be promoted as a Supplementary Order Paper to be referred to the select committee while it is considering the first tranche. This approach is supported by the Office of the Clerk. Splitting the Bill will assist with clear planning, and allow Parliament to begin considering the amendments sooner than if we waited until a single Bill was completed. 12 To draft the SLAB, administering departments and the PCO need to reach a position on which provisions empower the making of instruments with legislative effect, and when exemptions from publication and disallowance of secondary legislation should apply. Building on earlier Cabinet decisions, the PCO has iteratively developed the principles that will inform these decisions. I seek your endorsement of these principles below. 13 Since it is not always clear how these principles apply to particular empowering provisions, I also seek a delegation to decide how particular provisions should be amended in cases where the decision is not clear-cut and there is concern about the consequences of amending them in one way or the other. 14 Cabinet previously agreed that, in deciding whether or not instruments are secondary legislation, the focus should be on the substantive effect (and not the form) of an instrument: an instrument has legislative effect if it makes the law or alters its content, rather than just applying the law in a particular case (LEG-18- MIN-0041 refers). 15 The PCO has elaborated on that decision to clarify what distinguishes an instrument that has legislative effect from one that does not, taking account of the existing test in section 39 of the Legislation Act 2012, relevant case law, academic writing on the topic, and other legislation in New Zealand and overseas. The PCO has tested that guidance with administering agencies, the Legislation Design and Advisory Committee and the Regulations Review Committee. 16.3 if they create a framework to be applied again and again. 17.5 delegate a power to make instruments that change the scope of legislation (ie, altering the general categories of who or what the legislation applies to, or the places where it applies), whether by way of application, modification or exemption. 18 In practical terms, instruments are clearly legislative if they commence, amend, replace, or repeal other legislation, or set criminal offences and other penalties. Conversely, instruments are not legislative if they merely record case-by-case decisions (for example, decisions by courts or administrative decision-makers), give effect to transactions, or provide information or non-binding guidance or strategies. 19.6 if judicial review would be a more appropriate check on the exercise of the power than parliamentary oversight under the Legislation Bill. 20 I propose that the principles expressed in paragraphs 16-19 be used to decide which provisions will be amended (or not) to state that the instruments made under them are secondary legislation. 21 The Legislation Bill and SLAB will replace the definition of “disallowable instruments” in the Legislation Act 2012. That definition reflects, in part, the form of those instruments rather than their substantive effect. As a result of applying a substance-based test, some disallowable instruments will not become secondary legislation. 22 One consequence of determining that an instrument that is currently disallowable is not legislative in nature, is that the House will no longer be able to disallow that instrument. The PCO has consulted the Regulations Review Committee, which has expressed concern about this aspect of the Bill. The Committee recommends that all disallowable instruments should be classified as secondary legislation. I consider that this would be undesirable. It would perpetuate some of the inconsistencies the bill is intended to resolve by treating instruments that are administrative in nature as if they were legislation without good reason. However, changes to the status of these instruments will be brought to the attention of the House at the time of introduction so the Committee can review them during its examination of the Bill. 23 There are some special cases I wish to draw to your attention. 24 Instruments that grant exemptions from the obligations of an Act or secondary legislation can vary widely. Many exemption powers allow the decision maker to exempt either a class of persons or particular named persons. I propose that the Bill be drafted with the presumption that an exemption that only applies to particular named persons is not legislative, whereas one that applies to a class of persons is legislative. However, careful scrutiny will be given to exemptions for particular named persons if they are currently disallowable instruments and the presumption may be rebutted if the exemption power includes a power to impose substantive terms and conditions that effectively provide for an alternative legislative framework. 25 Some provisions empower a person to make instruments that could be used with either legislative or administrative effects. In some cases, these powers can easily be delineated into separate legislative and administrative powers by way of amendments to the empowering legislation. However, where publishing instruments made under a single empowering provision in two different places would be confusing, or would increase administrative complexity, I propose that all of the instruments made under the provision be classified as secondary legislation. 26.2 the full text of secondary legislation. 27 To cater for situations in which full publication would either be impracticable or would risk disclosing sensitive information, The Legislation Bill provides for two types of publication exemptions. 27.1 If a complete publication exemption applies neither the legislation nor its minimum legislative information need be lodged and published. Only Parliament can confer this type of exemption in empowering legislation. 27.2 If a partial publication exemption applies, the full text of the legislation need not be lodged with the PCO for publication, but “minimum legislative information” about it must be. These may be conferred in empowering legislation, but the Chief Parliamentary Counsel may also exempt legislation that it is impracticable to publish in full on the New Zealand Legislation website (as long as it is published in full elsewhere). 28 Complete publication exemptions could be warranted, for instance, for exemptions from the requirement for telecommunications network operators to have full interception capability under the Telecommunications (Interception Capability and Security) Act 2013. The existence of such exemptions could be revealing as to whether network operators have the ability to intercept telecommunications (where this is authorised by a warrant). Currently, they need only be issued to the class of network operators affected by the decision. 29 A partial publication exemption would be appropriate, for example, to some notices under section 60 of the Animal Products Act 1999 in relation to animal products intended for export. Those notices may contain information about the requirements of the authorities within importing countries negotiated through confidential trade agreements. The Director-General of Primary Industries currently has the power to restrict access to them. 30 Where Parliament has previously expressly authorised the makers to withhold publication of all or part of an instrument because it contains sensitive information, the SLAB will continue these exemptions. The PCO will, however, test with administering agencies that they are as narrowly drawn as is consistent with their purpose. 31 In a small number of cases new exemptions may be sought, as previously the legislative character of the instruments has not been recognised (and so nothing is stipulated in respect of their publication). I propose to consider these requests on a case-by-case basis under the delegation this paper seeks for me to approve amendments to particular provisions. 32 The Legislation Bill does not automatically exempt secondary legislation with a partial publication exemption from presentation, since not all of that legislation is sensitive. However, some of that legislation may still be sensitive and so unsuitable for presentation to the House. 33.2 if the whole instrument is sensitive, only its minimum legislative information is presented. 34 I seek approval to decide on such exemptions on a case-by-case basis where an exemption from presentation is essential, eg, on national security grounds. I will bring any new exemptions to the attention of LEG before the SLAB is introduced. 35 The Legislation Bill provides that generally the House may, by resolution, disallow any secondary legislation. However, secondary legislation may be excluded from disallowance by listing its empowering provision in Schedule 3 of the Bill.3 In line with earlier Cabinet decisions [SEC-17-MIN-0038 refers], exemptions from disallowance that are currently explicitly set out in legislation will be continued. 36 In a few cases, administering departments have suggested that a new exemption from disallowance might be appropriate (usually because the amendments identify instruments as secondary legislation has rendered their legislative character, and hence the potential for them to be disallowed, apparent4). I propose to consider these requests on a case-by-case basis under my proposed delegation to approve amendments to particular provisions. I will bring any new exemptions to the attention of LEG before the SLAB is introduced. 37 Owing to the large number of empowering provisions that will be amended by the SLAB there will inevitably be a need for some case-by-case judgements about whether particular provisions should be considered to create secondary legislation or whether an exemption from publication, presentation, or disallowance should apply. 38 I propose that authority be delegated to me to decide on the appropriate amendments in cases where the decision is not clear-cut and there is concern about the consequences of amending them in one way or the other. 39 I note that exemptions that allow a maker of secondary legislation to withhold its publication, or that exempt it from presentation or disallowance, are likely to attract particular scrutiny at select committee. Since the categorisation of instruments involves a degree of judgement, I expect that the committee will propose a range of changes to particular provisions. As an objective of this initiative is to facilitate Parliament's oversight of secondary legislation, I am comfortable with the select committee revising these judgements. 40 The Legislation Bill provides for a staged transition to the new publication requirements. To provide context for the following discussion, Figure 1 illustrates that transition. 41 On the main commencement date the Legislation Bill will repeal and replace the Legislation Act 2012. The SLAB will also commence (but not all amendments will come into force immediately). From this date, all makers of secondary legislation will have 12 months within which to provide the PCO with a list of their existing in-force secondary legislation. These lists will be published as a catalogue of secondary legislation on the New Zealand Legislation website, but makers will continue to publish the full text elsewhere. 42 The 12-month initial list deadline can be brought forward by agreement between the maker of the legislation and the Chief Parliamentary Counsel. Later deadlines can also be set by regulations for specified classes of legislation. 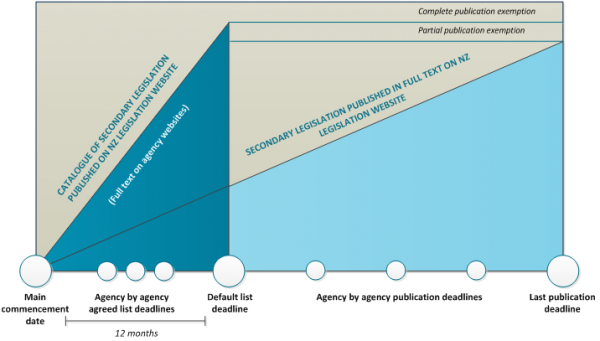 Over time, makers will be required to lodge the full text of secondary legislation for publication on the New Zealand Legislation website. The Legislation Bill provides for the setting of publication deadlines for this purpose. 43 To enable this transition from a legal perspective, it is necessary to apply the definition of secondary legislation to all relevant instruments on the main commencement date (so that, for example, the interpretation and disallowance provisions of the Legislation Bill apply to all secondary legislation from the repeal of the Legislation Act 2012), but to introduce the new publication obligations progressively as agencies are ready to provide their lists. 44 One way of doing this would be to amend each empowering provision twice: once, to insert a statement identifying the instruments made under it as secondary legislation; the second time, to repeal existing publication and notification and requirements, and replace them with the requirement to publish in accordance with the Legislation Bill. That, however, would result in a significantly longer, more complex Bill, and would be more prone to error as a result. 45 Instead, I propose that a new transitional provision be included in the Legislation Bill ensure that that these instruments will be secondary legislation immediately on the main commencement date, even if those SLAB amendments are not yet fully in force. 46.1 The PCO will provide an administrative solution. This may involve publishing a list or directory of empowering provisions that will ultimately be amended by SLAB, or by adding editorial notes to those provisions on the NZ Legislation website. 46.2 If necessary to provide greater clarity than this in this transitional phase, I propose that changes could be could be made to empowering provisions themselves under an expanded editorial power for the Chief Parliamentary Counsel to ensure that empowering provisions correctly reflect their status as secondary legislation and the resulting publication obligations under the Legislation Bill. This power is similar to other editorial powers the Chief Parliamentary Counsel has to update legislation to reflect changes in the law without any change in legal effect. 48.3 there is no requirement for the bylaws to be published in a central, accessible location (such as the Gazette). 49 Given the impracticability of identifying all of the makers of these bylaws, I consider it unreasonable to apply the requirements of the Legislation Bill to them (including, in future, revocation of bylaws that are not published in accordance with it). Furthermore, since these powers are also exercised by local authorities (whose legislation is already exempt), access to the bylaws made under them would only be partial. 50 While it is desirable that these bylaws ultimately be published in the same manner as other secondary legislation, this is likely to require more extensive changes to empowering legislation than is envisaged in the scope of this project. This should be taken up when the empowering legislation is revisited, or in future work on making secondary legislation made by local authorities more accessible, led by the Department of Internal Affairs [SEC-17-MIN-0038 refers]. 51 I therefore propose that bylaws made by entities other than local authorities under these provisions be given a complete exemption from publication on the New Zealand Legislation website. Existing publication and notification requirements for those bylaws would be preserved. I note that most of these bylaws are subject to the Bylaws Act 1910 and are therefore not disallowable under either the Legislation Act 2012 or the Legislation Bill. 52 Currently, empowering legislation for instruments that must be confirmed by Act of Parliament requires the explanatory notes to those instruments to indicate that they are confirmable, and the deadline on which they are revoked, if not confirmed. 53 Rather than this being required in every individual empowering provision, I propose that the Legislation Bill state this generically. I also propose to make it clear that a failure to include an explanatory note does not affect the validity of the instrument, as this has created unnecessary legal risk. 54 To prepare the SLAB, the PCO has consulted extensively with agencies that administer Acts about the amendments in it. In many cases, those administering agencies wish to consult with other bodies empowered by those Acts to make secondary legislation. To facilitate this process, I seek your approval for drafts of SLAB to be provided to any makers of secondary legislation that administering agencies or the PCO wish to consult. 55 SLAB will amend the New Zealand Superannuation and Retirement Income Act 2001. That Act contains a mechanism for political parties to signal their agreement on the parameters for New Zealand superannuation entitlements and funding. In the case of its amendment, the Minister of Finance must provide a statement to the House of Representatives about the consultation that has taken place with the political parties that are in agreement with the Part proposed to be amended. The amendments will not make any substantive changes to the Act, but the statement by the Minister of Finance is a statutory requirement. I seek your approval to consult political parties on those amendments. 56 As well as preparing the legislation, the project is planning for the implementation of the Bills. 57.1.1 Technology to assist with capturing and loading the initial lists of secondary legislation from agencies. 57.1.2 A lodgement portal that allows makers to submit information in future about new secondary legislation for publication on the NZ Legislation website. 57.1.3 An authoring solution, i.e. a MS-Word drafting template that enables agencies to draft secondary legislation in a structure and a format suitable for publication on the NZ Legislation website. 57.1.4 Changes to the NZ Legislation website to cater for secondary legislation drafted by agencies such that website users are able to find secondary legislation and to see the relationships between primary and secondary legislation and be informed of changes to legislation. 57.2 Provide support (training, documentation, coaching etc.) to help makers and agencies implement the new legislation, cope with the transitional publication arrangements, and adopt the lodgement portal, taking into account the diversity of support needs for different makers and agencies. 57.3 Provide support (training, documentation, coaching etc.) to PCO business units (drafting, publication and IT) to enable them to serve the makers and administering agencies for secondary legislation on an ongoing basis once the project has ended. 58.3 identify any agencies that will need a longer timeframe to locate, and provide information on, their legislation so that later deadlines can be set in regulations. 59 The PCO has made significant progress on the requirements for a lodgement portal and changes to the NZ Legislation website. The major technology investment for the project will be the lodgement portal. The PCO is exploring the potential to reuse the intellectual property underlying the CabNet system for this purpose, and will procure and build the portal iteratively between now and early 2020 to ensure a smooth roll-out. 60 The PCO has also undertaken CE and DCE level engagement with agencies that administer primary legislation and non-departmental makers of secondary legislation. To secure the breadth and depth of engagement needed to test and refine solutions and develop the change management support agencies will need, the project has recruited a reference group of agencies that administer secondary legislation. 62 Consultation on aspects of the proposals in this paper was undertaken with the Regulations Review Committee and the Legislation Design and Advisory Committee (LDAC). 63 The Regulations Review Committee was not persuaded that full publication exemptions could ever be justified, but was prepared to wait and review the proposed exemptions once the SLAB is before the House. 65 The Legislation Bill is consistent with the New Zealand Bill of Rights Act 1990 and the Human Rights Act 1993. 66 Legislation is required to implement the proposals discussed in this paper. 67 The SLAB holds a category 5 priority (to be referred to a select committee in the year) on the 2019 Legislation Programme. 68 The Regulatory Quality Team at the Treasury has determined that the regulatory decisions sought in this paper are exempt from the requirement to provide an Impact Assessment as the relevant issues have been addressed in the business case. 69 A gender analysis has not been undertaken. The Legislation Bill will benefit all users of legislation alike. 70 The proposal has no specific disability implications, but will make it easier for people with disabilities to find the law. Changes made to the New Zealand Legislation website to support the project will take into account the needs of users. 71 A press statement will be issued following the introduction of the Bill. 72 The PCO will publish a copy of this paper on its website. 4 note that Cabinet has previously agreed that in deciding whether or not instruments are secondary legislation, the focus should be on the substantive effect (and not the form) of an instrument: an instrument has legislative effect if it makes the law or alters its content, rather than just applying the law in a particular case (LEG-18-MIN-0041 refers). all of the instruments made under the provision will be classified as secondary legislation. establish the processes within PCO to support agencies on an ongoing basis. 23 note that the PCO will iteratively procure and build a lodgement portal that allows makers of secondary legislation to submit information about it for publication on the NZ Legislation website between now and early 2020. 1 The key exception at this stage is that secondary legislation made by local authorities will not be required to be listed or published. The other, minor, exceptions are discussed in this paper. 3 Currently, Schedule 3 lists every provision for which an Act states that the instruments made under it are not disallowable. This includes some provisions that will not be classified as secondary legislation empowering provisions by SLAB. Since only secondary legislation need be exempted from disallowance, Schedule 3 will be amended to remove those (redundant) provisions from it. 4 For example, Speaker's directions setting out the entitlements of members of Parliament to travel services under section 23 of the Members of Parliament (Remuneration and Services) Act 2013. 5 Under section 2 of the Reserves Act 1977 “administering body, in relation to any reserve, means the board, trustees, local authority, society, association, voluntary organisation, or person or body of persons, whether incorporated or not, appointed under this Act or any corresponding former Act to control and manage that reserve or in which or in whom that reserve is vested under this Act or under any other Act or any corresponding former Act; and includes any Minister of the Crown (other than the Minister of Conservation) so appointed”. 6 The definition of a road controlling authority includes any person having control of a road (which includes a street, motorway, beach, or "a place to which the public have access, whether as of right or not"). 7 The definition of a public authority includes an administering body under the Reserves Act 1977.